PHILADELPHIA — Last time the Philadelphia Eagles faced Peyton Manning, Michael Vick was the better quarterback. Vick and the Eagles (1-2) are 11-point underdogs against Manning and the high-powered Broncos (3-0) on Sunday. Don’t expect Vick or his teammates to be intimidated. In Week 9 of the 2010 season, Vick outplayed Manning in Philadelphia’s 26-24 victory over the Indianapolis Colts. Vick, returning after missing a month following a rib injury, threw for 218 yards and one touchdown, and ran for 74 yards and a score. Manning threw for 287 yards, one TD and two interceptions that day. Vick went on to win Comeback Player of the Year and led the Eagles to an NFC East title. He also started that season with 12 touchdown passes and zero interceptions. Manning has matched that mark in the first three games this year. Considering the Eagles have the NFL’s 30th-ranked defense and the Broncos are first in points (42.3) and yards (486.7), Vick and Co. will have to play mistake-free football on the road. And, LeSean McCoy and DeSean Jackson need to keep making big plays. Manning is off to an incredible start. The four-time NFL MVP has completed 73 percent of his passes for 1,143 yards, 12 TDs and no picks for a passer rating of 134.7. 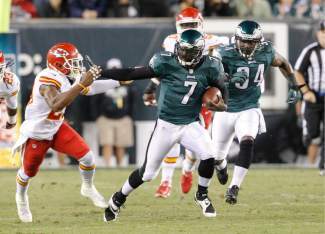 The key for Vick and the Eagles will be controlling the ball to keep Manning and his slew of receivers off the field. That hasn’t worked out for Philadelphia the last two weeks when it held the ball for a total of 40 minutes in two losses. Ball control isn’t Chip Kelly’s philosophy. His priority is running as many plays as quickly as possible. It sets up for what should be a high-scoring game. Oddsmakers have set the over/under at 58½ points. The total is the highest since 2004, when a Kansas City-Oakland matchup was set at 60. NOTES: Safety Patrick Chung is doubtful to play Sunday because of a shoulder injury. Rookie Earl Wolff would replace him in the starting lineup.